Doyle Brunson is the poker everyone knows, and who has earned having the word “Legendary” appear before his name. He holds the nickname “Texas Dolly,” which is derived from his Texas heritage. Doyle can typically be seen wearing a cowboy hat while he plays poker tournaments, which helps advertise his company Doyles Room. 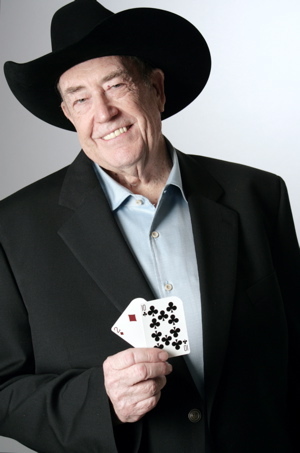 The Legendary Doyle Brunson was born on August 10, 1933 in Longworth, Texas. He was an outstanding athlete in both basketball and on the track, and his abilities earned the interest of the Minneapolis Lakers. However, while he was working at a factory during preseason, Doyle Brunson broke his leg and it has never completely healed. He never played for the Minneapolis Lakers and still uses a crutch from time to time because of his injury. After his injury, Doyle started playing poker full-time in Fort Worth with his friend Dwayne Hamilton. When they started to move around to find more games, they met up with fellow pros: Amarillo Slim and Sailor Roberts. This group became known as the Texas Rounders. They continued to travel around Texas, Oklahoma, and Louisiana, occasionally getting robbed and beaten, but always winning the games. Hamilton left the group to go back to Fort Worth, but the rest had other plans. They made their way to Las Vegas and proceeded to lose everything. The Texas Rounders disbanded then, but were still good friends. Doyle eventually made his way back to Las Vegas. Doyle Brunson got married in 1962 to his wife Louise, but later that year was diagnosed with incurable cancer. The doctors performed surgery so that Doyle could live long enough to see his child born, but after the operation there was no trace of the cancer at all. Doyle was the first person to ever win more than a $1 million total in poker tournament winnings, and he continues to win today. At the time of this writing, the Legendary Doyle Brunson has won 10 World Series of Poker bracelets, tied for the record with Johnny Chan and Phil Hellmuth. Doyle has also won a World Poker Tour Title. Doyle has two poker hands named after him. The first is 10-2 offsuit, which he won both of his WSOP Main Event championships with when he made full houses. However, Doyle doesn’t like to be known for such an inferior hand. Doyle also has A-Q named after him, as he has said that he NEVER plays that hand. However, TV cameras have proven that his is a blatant lie. Doyle Brunson is also known for his poker books Super System and Super System II. These books have become the poker bibles for poker players today. Doyle’s son Todd is also a professional poker player and has won a WSOP bracelet, making Doyle and Todd the first father-son combination to win WSOP bracelets. Doyle currently lives in Las Vegas, Nevada.